A fresh and beautiful double duvet featuring a stunning trailing floral design on a cream ground. Coordinating items available. Total duvet size 200x200 cm. A fresh and beautiful double duvet featuring a stunning trailing floral design on a turquoise ground. Coordinating items available. Includes two pillowcases.Total duvet size 200x200 cm. 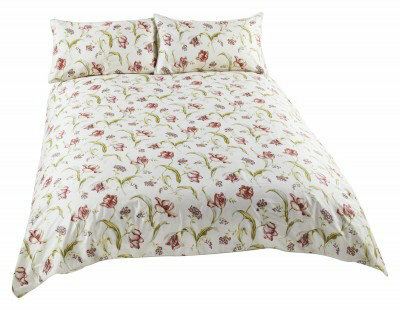 A fresh and beautiful king size duvet featuring a stunning trailing floral design on a cream ground. Coordinating items available. Includes two pillowcases. Total duvet size 230x220 cm. A fresh and beautiful king size duvet featuring a stunning trailing floral design on a turquoise ground. Coordinating items available. Includes two pillowcases. Total duvet size 230x220 cm. A beautiful floral double duvet design featuring lovely tulips on a duck egg blue ground. Reverse side features a coordinating leaf trellis design. includes 2 pillowcases. Coordinating items available. A beautiful floral double duvet design featuring lovely red tulips on an ivory ground. Reverse side features a coordinating leaf trellis design. Includes 2 pillowcases. Coordinating items available. A beautiful floral king size duvet design featuring lovely tulips on a duck egg blue ground. Reverse side features a coordinating leaf trellis design. includes 2 pillowcases. Coordinating items available. A beautiful floral king size duvet design featuring lovely red tulips on an ivory ground. Reverse side features a coordinating leaf trellis design. Includes 2 pillowcases. Coordinating items available. 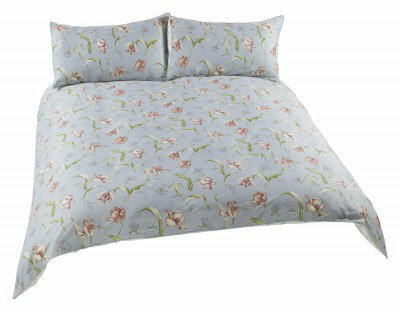 A beautiful floral single duvet design featuring lovely tulips on a duck egg blue ground. Reverse side features a coordinating leaf trellis design. includes 1 pillowcase. Coordinating items available. A beautiful floral single duvet design featuring lovely red tulips on an ivory ground. Reverse side features a coordinating leaf trellis design. Includes 1 pillowcase. Coordinating items available.